Contrary to what many believe, there is no explicit ‘right’ to privacy for many employees. Moreover, privacy laws are seldom absolute; there are almost always exceptions to their rules. As a result, issues of privacy tend to centre on moral questions rather than ones of legality. So what can an employee expect with regards to privacy of information? 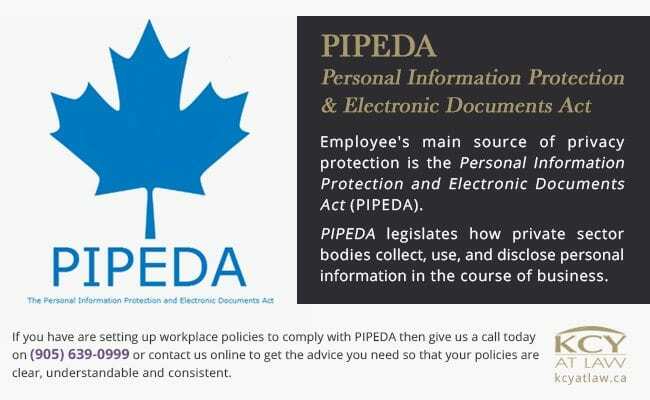 Employee’s main source of privacy protection is the Personal Information Protection and Electronic Documents Act (PIPEDA). PIPEDA legislates how private sector bodies collect, use, and disclose personal information in the course of business. PIPEDA applies to the collection of private employee information ranging from date of birth and marital status, to medical history and criminal record. It is intended to balance an employer’s need-to-know with an employee’s right to privacy. Fundamental to the act is that information be collected and disclosed with employees’ knowledge and consent. That is, employer’s must be clear about what data will be collected, why it is being collected and how it will be used. Only information relevant to the stated purpose of collection should be obtained. For example, an employee’s elementary school is likely unnecessary information for an employer trying to improve workplace safety. Furthermore, information about employees should only be used for its stated purpose. Emergency contact information, for example, should not be added to company’s email or calling list. Employees also have a right to know who is responsible for protecting their personal information and that the organization is taking appropriate security measures to do so. Information should be accurate, up to date, and only kept for as long as it is necessary or legally required. Lastly, employees must be able to access their information at all times to ensure that it is accurate and up to date. The best rule of thumb for employers is to be transparent. Make it clear to employees what is being collected and why. Explain how it will be used and when it will be destroyed. 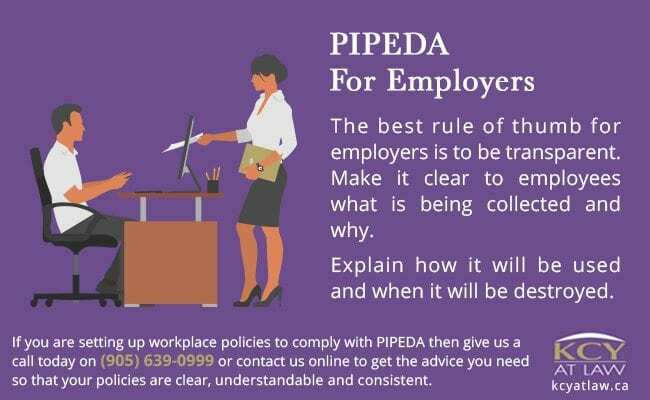 If you are developing workplace information collections policies and procedures KCY at LAW can help you ensure that your policies are clear, understandable and consistent with PIPEDA standards. 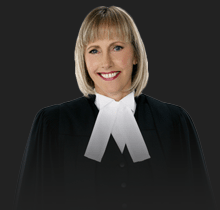 Call us today at (905) 639-0999 or visit us online to book your consultation.